A growing number of people are being hospitalised because of acid attacks, new figures show. The BBC's Victoria Derbyshire programme has been given unique access inside Europe's largest burns unit, to see how they help survivors recover. Under anaesthetic, Adele Bellis lies on an operating table at St Andrew's Centre at Broomfield Hospital as more than a dozen members of staff prepare for surgery. She has had so many operations over the last four years, since her ex-boyfriend paid a man to throw sulphuric acid over her, she has lost count. This time surgeons make a series of diagonal cuts along the scar on the right-hand side of her neck, before stitching back up the area . The aim is to relieve the pressure and improve her range of movement - before, it had been difficult for Adele to turn her neck. A CO2 laser is used to make multiple small holes across the scar to help improve the appearance. After an hour in theatre, it has proved a success. Yet it is only the latest step in a long, ongoing journey. The original attack took place in August 2014. Adele had been sitting at a bus stop on the phone to her friend, when she noticed a man in a tracksuit. "He had a black scarf around him, covering his mouth. He was lightly jogging, shaking a bottle," she explains. That was when the attack happened, causing life-changing burns to the right-hand side of her body and face. "From there it went into a blur, I was running in and out of traffic," she remembers. Adele was rushed to hospital in Suffolk for emergency treatment, before being moved to the specialist burns unit, the St Andrew's Centre for Plastic Surgery and Burns, in Essex. The advice at this stage was simple - "keep washing and washing". Only once the wound has reached a normal pH, can further treatment be carried out. A pH strip test was used to determine the acidity or alkalinity of the wound and the best course of treatment, and - when the time came - surgeons removed all the dead, burnt skin and placed donor skin on top. "Then I had skin grafts done," she says. "It was taken from my thigh and used on the side of my head, my hand, my arm, my chest." Following surgery, the scars require round-the-clock care, using special garments to place constant pressure on them to stop the skin becoming raised and lumpy. "During my recovery I had a mask I had to wear 12 hours a day, a big plastic one," Adele explains. "Then I'd have pressure garments while I was asleep which would go over my head. That was constant for 18 months." There are no mirrors in the burns unit, so Adele was not able to properly see her appearance until she left six weeks later. "Patients' perception of their own image is quite strong, and when they've undergone a trauma they might not be expecting what they actually look like," surgeon Mr Quentin Frew explains. Adele is one of many patients being treated at the St Andrew's Centre, with 24 dedicated burn beds and a 24-hour operating theatre. Demand for its services is increasing. 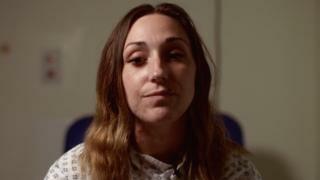 In the past five years, more than 500 patients have been admitted to hospitals across England from assault by corrosive substances, new figures obtained by the Victoria Derbyshire programme show. "The people we see here are only the tip of the iceberg really," says Mr Frew. "A lot of patients may not come to A&E. "They may treat themselves due to the fact of either embarrassment, or being worried about repercussions from gangs or members of family." It is not only the physical ramifications the unit looks to treat, but the mental scars as well. Maria Lawford, a senior counsellor at its Psychology Therapy Service, explains that "a trauma means that everything is thrown into the air, particularly with an acid assault". She adds: "Your whole world view kind of changes very quickly, immediately, and your sense of safety in the world is compromised." Adele says her counselling helped build her determination to not let her ex-boyfriend "ruin my life". She had been the victim of domestic abuse, she explains. "He basically controlled me, manipulated me, and when I didn't want to be with him I ended it. "I just don't think he wanted anyone else to have me, so in his mind - and by attacking me with acid - no-one would want me. So that's why he paid this guy to do it." The ex-boyfriend is now in prison. Adele says she has vowed to have "a normal life again", but it is not only her that has been affected. While the incident has brought her closer with her family, she says her father is "like a broken man now". She continues to remain upbeat, however. "Every time I come to hospital it's a positive thing because I know it's a step closer to helping me, and helping my scars," she says. "The acid attack is always going to be with me. It's always going to be my past no matter what. "I can't actually imagine myself without scars," she adds. In fact, as a testament to her continued recovery, she has begun to embrace them. "My new scars represent the new me," she says. "The new strong me." Acid attacks: What has led to the rise and how can they be stopped?